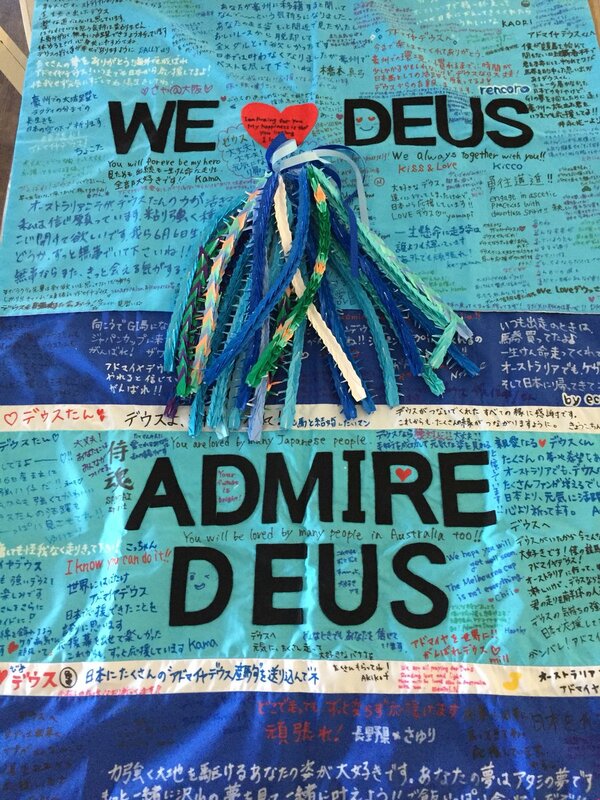 Admire Deus has received many messages from his fans!! Ans it sounds like he is recovering well after surgery. Thank you for the update, tachyon, I have been afraid to look & haven't seen much so was hoping that no news was good news. 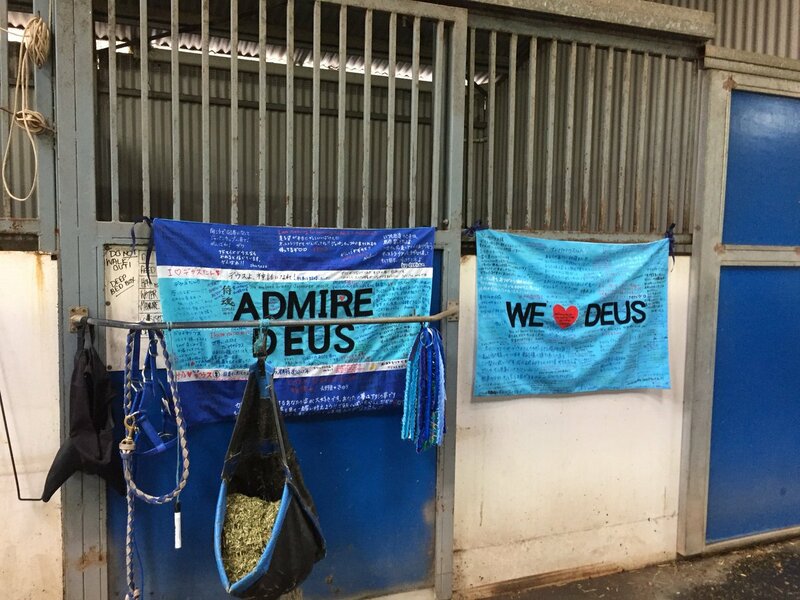 Get well soon Admire Deus!! Regal Monarch went down at the head of stretch in the 4th at Flemington. No news about the horse but the rider, Hong Kong star J. Moreira (excuse my misspelling) is off his Cup mount, and being replaced. BaroqueAgain1 wrote: Regal Monarch went down at the head of stretch in the 4th at Flemington. Regal Monarch was vanned to clinic with suspected shoulder injury. Euthanized on vets' advice. RIP Regal Monarch. Two-year-old Shanghai Bobby colt Big and Loud was pulled up heading into the last turn in the 1st at Del Mar, a 1-mile $55,000 MClmg for 2yos. No word yet from TVG. Patentar (FR) was injured in the 9th at Aqueduct, a 1 1/16-mile $25,000 claiming on the turf. Waiting on news from TVG. Prohibition took a bad step and was pulled up and vanned off today in the 3rd race at Del Mar 11/12/17. One of the spring's saddest stories threatens to get sadder still with the future of Japanese galloper Admire Deus hanging in the balance after a recent setback. Jamie Lovett from Australian Bloodstock, who helped purchase the highly-credentialed horse from Japan to race for trainer Darren Weir in Australia, said the horse had had emergency surgery over the past few days for the third time since breaking down during trackwork in the week of the Caulfield Cup. "He's had a little turn for the worst," a dejected Lovett said. "He had to go back into surgery to remove the cast on Sunday afternoon so he's back in recovery but it's very hard to make progress when he keeps having setbacks. "That's his third lot of surgery. I just feel for the horse. He's obviously very tough because he's really having a hard time but he's hanging in there. "We're doing everything to save him." Blue Moon Ace was just pulled up "in distress" during the Fabulous Strike at Penn. He was off-camera, but it did not sound good. BaroqueAgain1 wrote: Blue Moon Ace was just pulled up "in distress" during the Fabulous Strike at Penn. He was off-camera, but it did not sound good. Wish I'd read this before I watched the race on DVR. RIP, beautiful one. Blu Moon Ace, the 7-5 favorite in the $200K Fabulous Strike, broke down on the far turn and was pulled up. He had to be euthanized due to the extent of his injuries, per track officials. Sad to see Blu Moon Ace had to be euthanized. I really hope he is given a thorough autopsy. Admire Deus did not make it. Izvestia wrote: Admire Deus did not make it. RIP, handsome boy. My condolences and thanks to his connections who gave him the chance to recover, even in the face of overwhelming odds. I so wish this story could have had a happy ending, but it wasn't to be. Run free handsome, where ever it is that horses go after this so imperfect world. Run free. Two horses went down in the 5th at Turf Paradise. No info from TVG's temp Handicapsule host, Brad Free, who apparently can't be bothered to give a @$#& about either the horses or riders. BaroqueAgain1 wrote: Two horses went down in the 5th at Turf Paradise. No info from TVG's temp Handicapsule host, Brad Free, who apparently can't be bothered to give a @$#& about either the horses or riders. Per chart, Compadre Sam suffered a severe leg injury, fell, and then was euthanized. No info on Cayoke Star, other than he was unable to avoid injured rival, lost jockey and fell. He was probably in a studio in Santa Monica watching the same feed as the viewers. Tracks aren’t always so forthcoming with the information you were seeking. He probably didn’t want to nor shouldn’t have speculated. I understand that he was in a studio, but the better hosts will at least mention the horses and riders, and say that he/she will try to get more information on their fate. Even if more information isn't forthcoming, at least make the gesture of trying to find out. It looks more professional, to say nothing of being more compassionate. BaroqueAgain1 wrote: I understand that he was in a studio, but the better hosts will at least mention the horses and riders, and say that he/she will try to get more information on their fate. Even if more information isn't forthcoming, at least make the gesture of trying to find out. It looks more professional, to say nothing of being more compassionate. Well he is new at what he's doing. Send him an email with a little tact and perhaps he'll do better next time. It has been my experience that the odds of horses surviving a breakdown at TUP is minuscule. I often cringe when I see old classy types from so. CA end up there, especially via the TUP leading trainer.